Construction has started on the second tower of the $600 million Wisconsin Institutes for Medical Research. The complex will eventually include three towers next to UW Hospital, shown in the background. 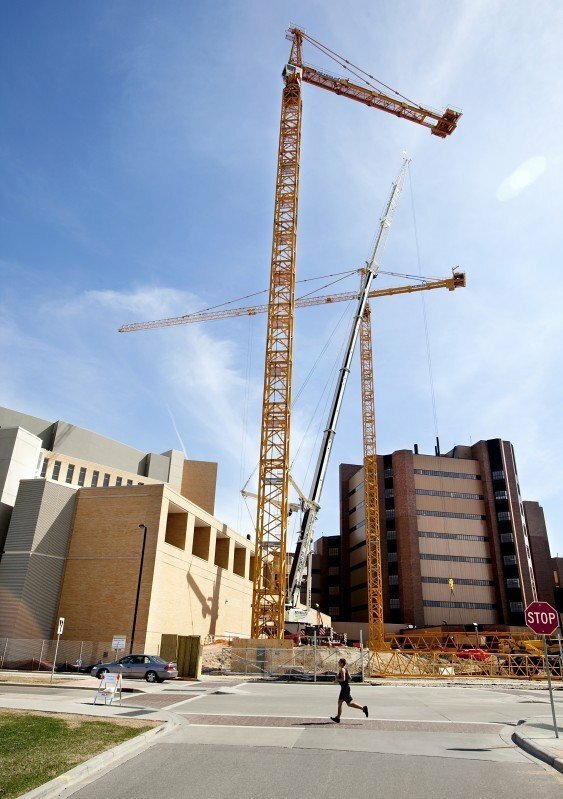 Construction cranes towering over the massive UW Hospital complex signal a big step in positioning Madison for a new era of medical research, officials say. Work started this month on the second tower of the Wisconsin Institutes for Medical Research, a $600 million, three-tower hub going up next to the hospital. The institutes will eventually house some 1,700 researchers and lab workers from a variety of fields to study cancer, heart disease, brain disorders and other conditions. Most are moving from aging buildings on the central UW-Madison campus. The goal "is to create a new kind of, almost revolutionary, model for how we do medical research," said Dr. Robert Golden, dean of the UW School of Medicine and Public Health. With research teams from many academic disciplines working in labs without walls, "it breaks down the traditional barriers between basic science, clinical science, public health science," Golden said. The $134.8 million, nine-story second tower, to open by fall of 2013, is supported by $67.4 million in state funding through Gov. Scott Walker's capital budget released last month. The medical school is paying the other half, with $24 million to be raised through a capital campaign, Golden said. The second tower's main research themes will be cardiovascular diseases, molecular medicine, neurodegenerative diseases, eye research and cancer. The building will house the McArdle Laboratory for Cancer Research and two new departments: neuroscience and cell and regenerative biology. They replace the departments of anatomy, physiology and pharmacology. About 500 researchers and lab workers are in the seven-story first tower, which opened in 2008. They also focus on cancer, along with orthopedic surgery and medical imaging. The $185 million cost of the first tower included construction of the first two floors of the second tower, mostly used for animal research. 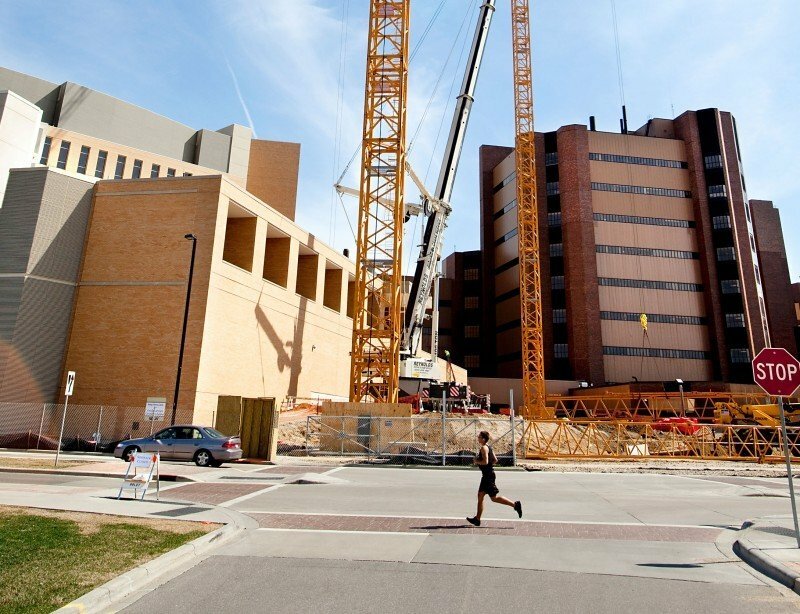 Work on an $11 million autopsy and pathology suite between the second and third towers is scheduled to start next year. Golden said "very preliminary discussions" have begun for the third tower. Construction could begin in 2014, and the medical school again hopes to get half of the funding from the state. Golden said the building might contain an incubator for spin-off companies and could house the Wisconsin State Laboratory of Hygiene, now on Henry Mall. The Wisconsin Institutes for Medical Research is different from similar projects going up on some campuses, Golden said, because of its proximity to UW Hospital and the Health Sciences Learning Center, which houses the medical school. The researchers and medical students frequently walk by and share elevators with patients and families desperate for new treatments and cures. "They're constantly reminded of the importance of their work," Golden said. A rush of buildings is set to open in the coming months on the UW-Madison campus — marking the completion of a spate of major projects on the state's flagship campus.